Note some revealing word choices by Kristof: fanatical Muslims only seem to murder in the name of God, implying that their self-declared motivations shouldn’t be taken at face value; and the university professor was falsely accused of insulting the Prophet Muhammad, implying that “insulting the Prophet” is a crime one could legitimately be accused of. The vast majority of Muslims of course have nothing to do with the insanity of such attacks — except that they are disproportionately the victims of terrorism. Indeed, the Charlie Hebdo murders weren’t even the most lethal terror attack on Wednesday: A car bomb outside a police college in Yemen, possibly planted by Al Qaeda, killed at least 37 people. 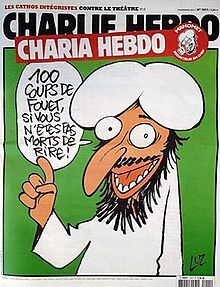 I’m not sure how another example of Islamic terrorism is supposed to make Islam look better, but in any case there’s no reason to think Al Qaeda or the Charlie Hebdo terrorists are clinically insane: their actions are completely comprehensible based on the beliefs they profess. And unfortunately, many of those beliefs are not extremely rare in the Muslim world. For example, a 2013 Pew poll found that in many countries, large majorities of Muslims think sharia (which mandates severe punishments for blasphemers, heretics, adulterers, homosexuals, etc.) is the revealed word of God and should be the law of the land — 86% in Malaysia, 83% in Morocco, 74% in Egypt, 72% in Indonesia, 71% in Jordan, to name but a few. And where sharia is the law of the land, you will not find freedom or equality or tolerance. Just last week, Raif Badawi, a Saudi Arabian writer, was shackled in a public square and given 50 lashes out of the 1,000 he was sentenced to for “insulting Islam” on his website. The great divide is not between faiths. Rather it is between terrorists and moderates, between those who are tolerant and those who “otherize.” … Let’s denounce terrorism, oppression and misogyny in the Islamic world — and everywhere else. But let’s be careful not to respond to terrorists’ intolerance with our own. It’s not intolerant to criticize bad ideas, or to point out the link between beliefs and the actions they motivate. Terrorism, oppression and misogyny are not randomly distributed across the globe: they are products of ideology and culture. The real divide is between dogmatism and reason, between tribalism and humanism, between theocracy and liberalism. If your faith is on the wrong side of that divide, then it’s part of the problem. In a New York Times piece entitled “The Subtle Sensations of Faith,” David Brooks tries hard to avoid saying anything too concrete or specific that might cast doubt on his faith that faith is The Bestest Thing Ever. Between mind-numbing platitudes (“faith is unpredictable and ever-changing”) and word salad (“trying to turn moments of spontaneous consciousness into an ethos of strict conscience”), however, those readers who remain awake should be able to see why he’s wrong. All this discerning and talking leads to the main business of faith: living attentively every day. The faithful are trying to live in ways their creator loves… They are using effervescent sensations of holiness to inspire concrete habits, moral practices and practical ways of living well. Indeed: That’s exactly what ISIS is doing when it enforces sharia by the sword. And that’s what the Catholic Church is doing when it fights contraception and abortion and gays. Who’s to say what it is that the creator loves? Or hates? The problem with religious faith is that it fills the void of doubt with conviction that cannot be argued with. Brooks tries to make it look respectable, but faith is a thief taking credit it hasn’t earned. We are better served by letting the wonders of our universe inspire us to expand our knowledge through careful reasoning, one step at a time. As for those mysteries we haven’t yet solved, we should reserve judgement — never surrender them to faith. Several of the victims were old women but witch doctors — village healers who are sometimes involved in the witch hunts — have also targeted young children and albinos, the latter because their body parts are thought to bring prosperity. There’s no such thing as witchcraft. People who believe in witchcraft are wrong. Belief in witchcraft motivates some people to kill innocents (who they would not otherwise kill). The fact that people believe in witchcraft is bad: our world would be a better place if no one believed in witchcraft. We should actively and unambiguously criticize the belief in witchcraft, in an attempt to eradicate it. The fact that a majority of those who believe in witchcraft are nonviolent and condemn murderous witch hunts doesn’t mean that belief in witchcraft isn’t a problem and shouldn’t be criticized; nor should such criticism be conflated with bigotry or discrimination towards peaceful believers in witchcraft. As the militant group the Islamic State in Iraq and Syria, or ISIS, has seized vast territories in western and northern Iraq, there have been frequent accounts of fighters’ capturing groups of people and releasing the Sunnis while the Shiites are singled out for execution. I was going to make some observations about Islam, but I wouldn’t want to be a racist imperialist fascist bigot. The soon-to-open National September 11 Memorial Museum will include a short video called “The Rise of Al Qaeda,” which “refers to the terrorists as Islamists who viewed their mission as a jihad.” I’m sure you’ll be shocked to hear that some people are unhappy about that. … The museum did remove the term “Islamic terrorism” from its website earlier this month, after another activist, Todd Fine, collected about 100 signatures of academics and scholars supporting its deletion. But for Mr. Elazabawy, and many other Muslims, the words “Islamic” and “Islamist” are equally inappropriate to apply to Al Qaeda, and the word “jihad” refers to a positive struggle against evil, the opposite of how they view the terrorist attacks. Establishing the rule of God on Earth. Attaining martyrdom in the cause of God. Purification of the ranks of Islam from the elements of depravity. Al-Qaeda’s motives are explicitly Islamist: that’s all they ever talk about. Even if most Muslims disagree with some parts of al-Qaeda’s theology, it is by no means an implausible interpretation of Islam. (It’s not as if al-Qaeda is our only example of Islam-inspired violence.) And that means that Islam is part of the problem. Consider, by analogy, the Inquisition — which I’m pretty sure had something to do with Christianity. Why do we no longer see Christians torturing and killing heretics and blasphemers? Is it because the scripture and doctrine of Christianity provide no support for such actions, and those inquisitors were all lunatics? No: it’s because most Christians no longer believe that (those parts of) their scripture should be followed literally. On the other hand, most Muslims still believe that the Koran, which is relentless in its vilification of unbelievers, is the perfect, unquestionable, literal word of God. Anyone who lends legitimacy to that belief system, even if opposed to violence himself, helps provide a basis upon which violent groups can thrive and attract followers. It matters what people believe. If we want to avoid future atrocities, we need to be honest about what people have done, and continue to do, in the name of faith; and we must be uncompromising in criticizing irrational beliefs. If that offends anyone — sophisticated or not — too bad. If the argument’s bottom line agrees with what you already believe, go to 8. Else, begin reviewing the argument in detail. If you find anything that is just too offensive or counter-intuitive to entertain, go to 8. Else, if you find anything that could be given a label known to be bad (such as “socialism” or “scientism” or “reductionism”), go to 8. Else, if you’re able to rebut a simplistic, caricatured version of the argument, go to 8. Else, conclude there must be something wrong with the argument that escapes you at the moment. (If you’re curious, google “why X is wrong”.) Go to 8. Turns out you were wrong — change your mind! Go to 9. Turns out you were right! There’s no need to change your mind. Congratulate yourself for being rational.